The perfect multivitamin is here for those needing extra minerals to stimulate growth of their hair, skin, and nails. Our Hair, Skin, & Nails® supplement supplies your body with a full range of vitamins, including Vitamin A, B6, B12, C, D, and E, as well minerals such as calcium, magnesium, and zinc. These combine to ensure the body is receiving all of the nutrients it needs to regulate itself and grow properly. In addition, Hair, Skin, & Nails® provides a b-complex vitamin called Biotin. Biotin has been shown in multiple studies to improve firmness, hardness, and thickness of nails. It helps promotes hair growth by playing a vital role in the production of amino acids, the building blocks of protein. Biotin also helps monitor and regulate several bodily functions, like the production of new skin cells and proper functioning of the oil glands. Having low levels of Biotin, other b-vitamins, or other nutrients in general can damage both your inner health and outer appearance. If you have a lack of biotin in your system, that can lead to dry or rough skin, dandruff, and a flaky and dry scalp (hair). 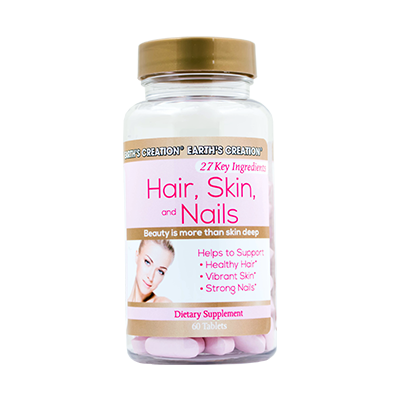 Try Hair, Skin, & Nails® today, a complete multivitamin with biotin for your everyday needs.